What Are Plant Based Protein Powders? What Are the Different Types of Plant Proteins? What Are the Uses & Benefits of Plant Protein? Who Can Benefit From Plant Protein? How Do I Take Plant Protein Powder? Are There any Side Effects of Plant Protein? How Do I Pick a Good Plant Protein Powder? Each and every day, our bodies require certain nutrients, vitamins and minerals in order to function properly. And while there are a wide variety of micro and macronutrients that are needed for proper function of the human body, one of the most important is protein. Protein is used by the body for a number of important roles, including the growth of new cells, muscle growth, the repair of damaged muscle tissue, the production of hormones and enzymes, and more. The amount of protein you need on a daily basis depends on a few factors, including your gender, age, weight and activity level. You can use this handy calculator to see your recommended protein intake. A lot of people will obtain adequate protein through their diet alone, while others may not. For this reason, many people like to use protein powders in order to increase protein intake and improve overall health. There are a couple different types of protein supplements, but today we’re here to talk about the plant based ones. In order to help you find a good product we’ve researched & narrowed down the best plant protein powders on the market right now. 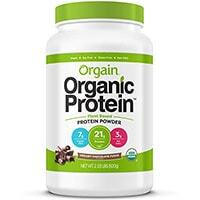 Orgain Organic Plant Based Protein Powder is a fantastic product containing a blend of the best types of plant proteins. With 21g of protein in each serving, plus 5g of fiber and only 3g net carbs, this is quite simply a great choice of plant protein powder. It uses a blend of brown rice protein, hemp protein, pea protein, and chia seed to create a balanced blend of complete proteins. This is a fully USDA-certified organic protein powder, as well, with every ingredient being certified organic. 21g protein blend, consisting of brown rice protein, pea protein, chia seed, and hemp protein. Who makes it: This product is made by Orgain, a rapidly growing supplement manufacturer specializing in natural, organic and effective health products. Founded by Dr Andrew Abraham, a medical doctor and cancer survivor, Orgain’s founder and employees know full well the vital importance of nutrition for our overall health. Today, Orgain makes a variety of health supplements and protein powders, primarily using plant-based, natural, organic ingredients. They may not yet be a household name, but given their rapid growth and excellent reputation, we believe that this is one of the best natural supplement producers out there. Bottom line: Overall, this is one of the best plant based protein supplements money can buy. It uses an excellent blend of ingredients, all of which are certified organic. It’s free of the most common allergens and dietary sensitivities, which means it’s a great choice for nearly anyone. It’s made by a great company. Plus, having a choice between two tasty flavors and an unflavored version, this supplement is very versatile, as well. Naturade Vegansmart All-in-One Nutritional Shake offers a potent blend of nutrient-rich ingredients. It contains complete proteins, a whole food complex, 22 vitamins and minerals, fiber, prebiotics, digestive enzymes and more – all wrapped into one easy-to-use drink mix. This product is ideal to use as a meal replacement, simply because it covers so many different aspects of overall nutrition. Who makes it: This product is made by Naturade, a large and well respected health product manufacturer. Founded over 9 decades ago in 1926, Naturade continues with its key founding principles; better ingredients for better products. In the 1950’s, Naturade was largely credited with developing the first commercially viable soy protein powder, and today, they continue to be on the cutting edge of the health product industry. 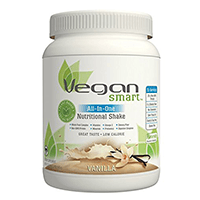 Bottom line: This product goes above and beyond the typical plant protein powders on this list by providing a wide variety of helpful ingredients. It does offer a full 20g of protein, alongside a whole food blend, fiber, digestive enzymes, and a lot more. Because of the wide variety of included ingredients, this product is a bit on the pricey side, but still presents good value for those looking for a meal replacement mix. Vega Protein & Greens is a unique and effective plant protein product that combines proteins with 2 full servings of greens. For protein, it uses pea, hemp, saviseed and sprouted brown rice to craft an amino acid-rich blend, and then adds kale, spinach, broccoli and alfalfa for a healthful boost of all-important veggies. It’s also a very clean product, made without the use of gluten, GMOs, dairy, animal products, soy, or artificial ingredients. 2 servings of greens in every serving! 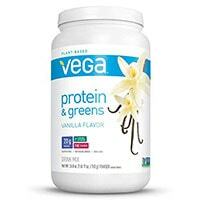 Who makes it: This product is made by Vega, a large manufacturer of clean plant-based nutritional products. Vega primarily makes protein powders and drink mixes using plant-based, wholesome ingredients, although they are now expanding into all sorts of different supplement lines. The team at Vega uses their knowledge of nutrition and fitness to craft effective, sustainable and healthful supplements for the growing population of health-minded citizens. They’re a great company with a wide variety of great products. 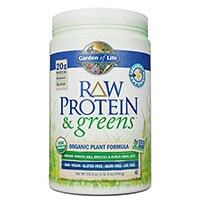 Garden of Life Raw Protein & Greens contains 20g of protein per serving, along with a healthy serving of greens. It uses brown rice protein, chia protein, and pea protein, alongside 6 different powdered veggies, including spinach, alfalfa and more. It’s one of the best organic plant based protein powders, and it’s made by a very well-known and established supplement manufacturer. Who makes it: This product is made by Garden of Life, which is the #1 brand in the natural products industry. They manufacturer a wide variety of supplements and health foods, and you can find their products in stores across the globe. They are committed to using organic, non-GMO, sustainably sourced ingredients to develop their products, and they have built a reputation of superior quality and consistency. Bottom line: This is a powerful protein powder that also delivers a hefty serving of green superfoods. It’s a very clean product, using USDA certified organic ingredients, and is an excellent choice for those looking to increase their protein intake. It is a bit on the pricey side, but given the included ingredients, the price still represents a good value. 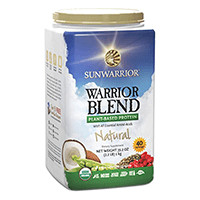 Sunwarrior Warrior Blend is an effective plant based protein powder that uses a blend of pea protein, hemp protein, and goji berry. With 20g of protein in each serving, alongside only 100 calories and 1.5g of fat, this healthful blend is a great way to increase your protein consumption. It’s also certified USDA organic, and free of soy, gluten, dairy, lactose, and GMO ingredients. There are several different flavors available, with natural/unflavored, mocha, chocolate, berry and vanilla. Gluten free, GMO-free, dairy free, lactose free, and soy free! Who makes it: This product is made by Sunwarrior, a supplement manufacturer specializing in plant-based, natural supplements. Sunwarrior manufacturers a variety of plant-based proteins, superfood supplements, and other natural health products. They believe in using all-natural ingredients to develop effective and healthy supplements for their customers. They are also committed to supporting the planet, through the use of sustainably sourced, organic ingredients, recycled packaging, and more! Bottom line: Overall, this is an excellent product at a very reasonable price. Its high protein content, low calories and fat, and certified USDA organic ingredients combine to make a well-rounded and effective product, and it comes with the backing of one of the most respected natural supplement manufacturers in the industry. Plus, having 5 different flavor options is great, to find the best tasting one for you! 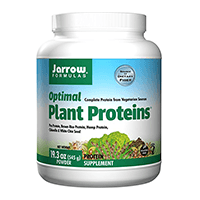 Jarrow Formulas Optimal Plant Proteins is a good protein from a good manufacturer. It uses brown rice, peas, chia, hemp and more to deliver a balanced blend of protein with a full 21g protein per serving. It’s also very fiber-rich, gluten free, contains no added sugar, and is 100% vegan. Who makes it: This product is made by Jarrow Formulas, a nutritional supplement company based in Los Angeles, California. Founded in 1988, Jarrow now distributes their line of high quality fitness supplements throughout North America. They are a good company with generally good products. Bottom line: It’s rich in protein and in fiber, and comes with the backing of a well-respected company. With that said, reviews have mentioned that some people experience a gritty texture/taste, and it’s also a bit on the pricey side. Nutiva Organic Plant Protein Superfood is a unique and effective product containing over 30 different superfoods, alongside 21g of protein per serving. By using organic, healthy ingredients, Nutiva has crafted a versatile and nutritious product that not only provides a substantial amount of protein, but also all the benefit associated with the superfoods it contains. 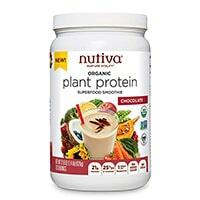 Who makes it: This product is made by Nutiva, a large and growing producer of high quality nutritional supplements. Nutiva focuses on using wholesome, healthy, and sustainably sourced ingredients to craft their growing line of nutritional products. They use all organic ingredients, and source from ethical and sustainable partners whenever possible. Bottom line: This is a great product from a great company that combines a solid dose of complete proteins with a huge array of superfoods and other nutrients. This product can provide a ton of benefits, both as a meal replacement and as an overall wellness booster. It’s a bit on the pricey side, and there are only 18 servings in each container, but it still provides good value considering everything that it includes. 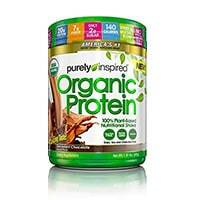 Purely Inspired Organic Protein Shake is a good product containing 20g of protein in each serving. Using a mix of organic ingredients, fruits and veggies, this product can be a good all-around health booster. The protein comes from brown rice and pea protein, while added organic fruits and veggies like spinach and broccoli add additional nutrients. Who makes it: This product is made by Purely Inspired, a rapidly growing supplement manufacturer based in the USA. Purely Inspired makes a variety of health and fitness supplements, ranging from protein powders to weight loss supplements. By focusing on using organic, natural and simple ingredients, Purely Inspired is able to make highly effective and healthful supplements. Bottom line: This is a good product for those looking for a protein/fruit & veggie blend. It combines a lot of different ingredients to provide a ton more than just protein. With that said, there are only 18 servings per container, and the product is a bit pricey compared to our other recommendations. 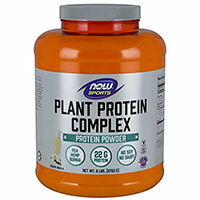 Now Foods Plant Protein Complex is a simple and effective choice made by one of the largest and most well-respected companies in the supplement industry. It contains 22g of protein per serving, coming from brown rice protein, pea protein, hemp protein and quinoa protein. Its ingredients are GMO-free, and sweetened with Stevia. Who makes it: This product is made by NOW Foods, one of the biggest supplement companies in the world. NOW Foods makes health and fitness supplements, health foods, and a variety of other products. They have been in business since 1968, and they continue to offer excellent products at very reasonable prices. Bottom line: It has a good protein amount, but there’s nothing particularly noteworthy about it beyond that. It is fairly affordable, but it’s only available in one flavor (vanilla), and some reviews have mentioned that many don’t like the flavor. It’s a good product, but there are better options. 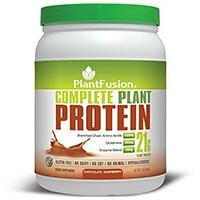 PlantFusion Complete is a good plant protein powder that uses pea protein, artichoke protein, sprouted quinoa powder and sprouted amaranth powder. This potent blend of nutritionally-rich ingredients provides 21g of protein in each serving. It’s also infused with additional amino acids, including over 3g of L-glutamine, an amino acid that is very helpful for post-workout recovery. This is a solid blend of healthy proteins from a great company. Who makes it: This product is made by PlantFusion, an up-and-coming natural supplement producer founded in 2009. Formed by two health enthusiasts with a shared vision of a better supplement company, PlantFusion uses whole food and plant-based ingredients to craft effective nutritional supplements. They use sustainably sourced, organic ingredients wherever possible, and they avoid the use of unnecessary fillers in their products. Bottom line: It comes from a great company, and uses a good blend of healthful protein sources. The addition of L-glutamine and enzymes make a great product even better – plus, it provides good value for your hard-earned dollars. As the name suggests, plant based protein powders are powdered supplements that are rich in protein derived from plant sources. Common examples include brown rice protein, hemp protein, pea protein, soy protein, etc. These plant-based powders are not as popular as their dairy-based cousins, such as whey protein, but popularity and awareness of these plant protein powders is certainly growing. There are a variety of reasons why you may wish to use a plant based product instead of a dairy/meat based product. Perhaps you are a vegetarian or vegan, and want to avoid animal products. Perhaps you are lactose intolerant, or simply sensitive to dairy products. Or, perhaps you’re interested in the amino acid profile offered by plant-based proteins. Maybe you are concerned with the environmental impact of animal-based proteins, and would prefer a more simple and natural route. Plant-based protein is an all-encompassing term for protein powders derived from natural plant sources. Many of the most effective plant based protein powders use a blend of several different types of proteins in order to reap the full plant protein benefits. Brown rice protein – brown rice protein powder is a very commonly used ingredient in plant based protein powders, and for good reason. Some recent studies have put the quality of brown rice protein in line with whey protein, which is very significant given the fact that whey protein is generally considered to be somewhat of a “gold standard” in the protein powder world. Brown rice protein offers significant plant protein powder benefits, and it’s very affordable and accessible. Pea protein – pea protein is one form of plant protein that is growing rapidly in popularity. Heralded for its high protein content and significant health benefits. Additionally, it’s fairly cheap to produce, so it’s commonly used in blends. Soy protein – soy protein is very popular, mostly because it’s one of the cheapest forms of plant based protein. However, it’s not necessarily the best option for a lot of people. For one, some people are allergic or sensitive to soy. Even if you’re not allergic to soy, there are some concerns with the long-term use of soy protein. In small quantities, soy protein is fine for most people, but for most, avoiding products that use soy as their primary protein source is the best bet. Hemp protein – hemp seed protein is another popular ingredient that has experienced rapid growth in recent years. Hemp is the male version of the marijuana plant, but don’t worry – hemp protein won’t get you high. Hemp is not psychoactive at all, and its seeds are very rich in protein with an impressive amino acid profile (all 9 essential amino acids, plus 11 other aminos). Dr. Axe calls hemp the perfect plant-based protein, and many in the industry tend to agree. Other types – the above types are the most popular, but there are definitely other types. Protein can be extracted from a variety of plants and vegetables, so you could see ingredients like artichoke protein, quinoa protein, chia seed, etc. It would be rare to find one of these ingredients on their own in a product, but they are often added to protein blend for more variety. As mentioned, the majority of plant based protein powders use a blend of the types listed above. Blends are the best way to get a balanced amino acid profile. There are 9 essential amino acids, and many other non-essentials. To get the most plant protein benefits, you’ll want to find a product that contains a variety of different protein sources and provides a good profile of amino acids. High protein, but low calorie, low fat, low carb, etc. Specific benefits will vary slightly from product to product, but overall, the benefits of eating adequate protein are clear – and these types of products can help you reach the ideal daily protein intake for your body and lifestyle. Vegetarians – if you’ve made the choice to follow a vegetarian diet, you likely know already that it can be difficult to get enough protein at times. Sure, there are plenty of protein-rich foods that are vegetarian friendly, but still, many of the primary sources of protein in our modern diets are meat-based. Vegetarians can benefit from plant protein powders that help keep their diet on track while still allowing them to follow a true vegetarian diet. Vegans – like vegetarians, vegans can have trouble reaching adequate protein intake levels. In fact, it’s significantly harder for vegans, because dairy, eggs, and other non-meat animal products are excellent sources of protein. And while vegetarians could just use a whey protein powder, vegans need to find something that is completely free of animal products: like plant protein. Dieters – if you’re on a diet, you can benefit from adding extra protein to your diet. Protein helps you feel full, and stay full for longer, which makes it easier to avoid snacking and stay on track, diet-wise. Plus, many plant based protein supplements are good choices for dieters because they’re generally fairly healthy in general, with relatively low calories, fat, etc. These protein products can also be used to make delicious and nutritious protein shakes, which can be used as filling snacks and/or meal replacements. Athletes – athletes need significantly more protein than the average person, because protein is a key part of muscle repair and growth. Any type of protein will work for this purpose, but as previously explained, many people prefer plant-based sources for a variety of good reasons. Health-conscious people – if you’re someone who considers themselves to be health-conscious, you’ll like that most plant-based proteins are quite healthy and aligned with many popular dietary preferences. It’s easy to find organic protein powder, gluten-free protein powder, GMO-free protein powder, etc. In fact, some of our top recommendations meet most or all of these requirements. Plant based protein powders will need to be mixed into water, milk, or thrown in a protein shake (with whatever other ingredients you want). Protein shakes make a great snack or meal replacement, and especially if you choose an unflavored or simple flavored protein powder, they can be very versatile. We generally recommend going with unflavored, or simple vanilla/chocolate type flavors to keep your options open. As for the protein dosage, it varies from product to product. Most protein powders will have a scoop included in the package, which is a pre-measured serving (or sometimes ½ serving). This makes it easy to measure out a serving size, and cuts out the guesswork. With stronger plant protein products, you’ll typically get around 15-25g or protein in each serving. Side effects associated with plant protein are fairly rare. Some minor gastrointestinal issues may occur in some people, such as gas, nausea, stomach upset, etc. If you notice stomach issues after taking a protein powder, consider taking a smaller dosage next time to reduce these effects. Because plant-based proteins can use a wide variety of ingredients, there is always some potential for an allergic reaction or ingredient-specific sensitivity. If you have allergies or dietary sensitivities, be sure to take a close look at the ingredient labels of any products you’re considering. Like most supplements, there are no shortage of options when it comes to choosing a high quality plant protein powder. We already put together a list of the top 10 above, but you’ll also want to keep some basic principles in mind when making your selection. Protein content – first and foremost, take a look at the protein content. Most products will have somewhere between 15 and 30g of protein in each serving, which is clearly a fairly wide range. It’s also important to consider the serving size, because one product might have less protein per serving than another, but it may also have a much smaller serving size. Type of protein – “plant based” protein is a broad category. If you’re looking for a specific type of protein, or if you’re looking to avoid a specific type, that should be a major factor in your decision. Also, keep in mind that the majority of these products use some sort of blend consisting of several types. We have more detail on the different types of plant based proteins in the section above. Brand reputation – there are tons of companies making plant based protein powders, but they are not all created equal. Generally, going with more established and reputable companies is your best bet. On this list, we’ve only recommended products from trustworthy and well-established companies. If you choose to shop elsewhere, be aware of the company you’re buying from and their reputation. Value – unless you’re a billionaire (in which case, congratulations!) the price and value of the product should be a factor. With that said, it should not be the main factor, as a lower price doesn’t necessarily mean a worse product, and a higher price doesn’t necessarily mean a better product. Also, when comparing the price of multiple products, don’t just look at the price of the packages – try to compare the value based on the price per serving. Taste/flavor – most plant-based protein powders are flavored, although a few are offered unflavored. It’s difficult to choose the best tasting plant protein powder without actually trying them all for yourself, but what you can do is pick a flavor that you think you’ll like. And not only that, try to pick one that can be versatile. For example, a vanilla flavored powder could be mixed in a shake with fruit, whereas a chocolate flavor would not go as well with many fruits. Another trick is to read through user reviews of the product and look for what they’re saying about the taste. We hope that you now feel more knowledgeable on the world of plant based proteins. If you’re ready to make a purchase, choose a product from the list above and give it a try! If you have any questions, don’t hesitate to ask. Lastly, don’t forget to explore the rest of this website. You’ll find detailed reviews and informational guides for nearly every type of supplement category on the planet – with more being added all the time!